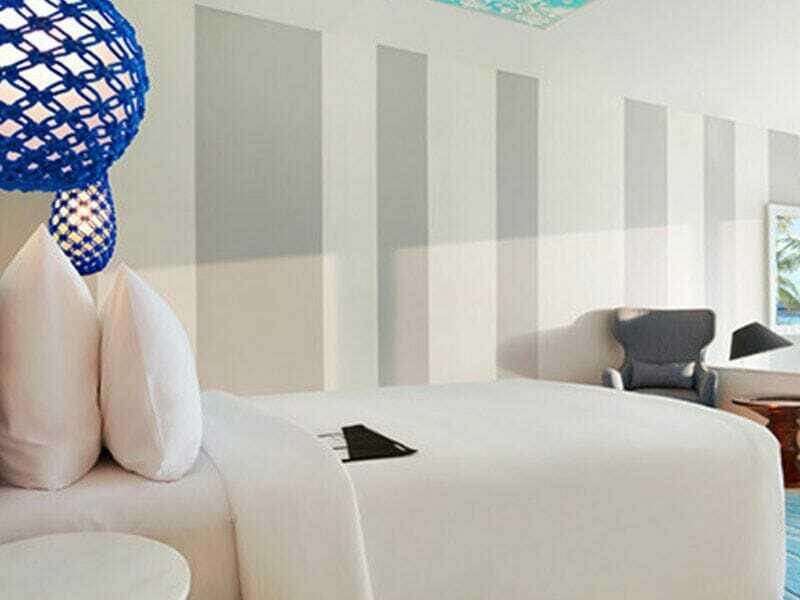 Ultra-modern and absolutely luxurious—Le Meridien Bali Jimbaran has all the makings of a perfect Bali getaway! Settle into your spacious room and embrace its contemporary décor, take a dip in the expansive lagoon pool, treat yourself to homemade gelato from the poolside café and grab a seat at the rooftop bar for one of Jimbaran Bay’s famous sunsets—that is just the first afternoon! All this and more await at the exquisite Le Meridien Bali Jimbaran. What are you waiting for? Whether travelling on your honeymoon or with the whole family, Le Meridien Bali Jimbaran is the ideal combination of modern western luxury and traditional Balinese charm. 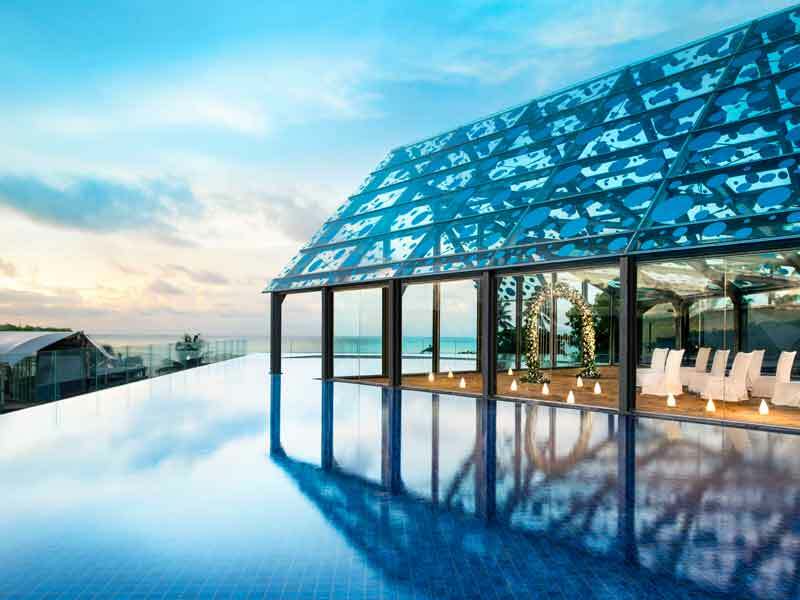 The building itself is exquisite—an ultra-modern structure that encapsulates water features and the pool. Tropical palms dot the grounds and the guestrooms capture the natural light. Contemporary furnishings feature a subtle Balinese style and soothing curves are all around—from the patterns in the custom artwork, to the round-finished interior furnishings and even the shape of the pool. 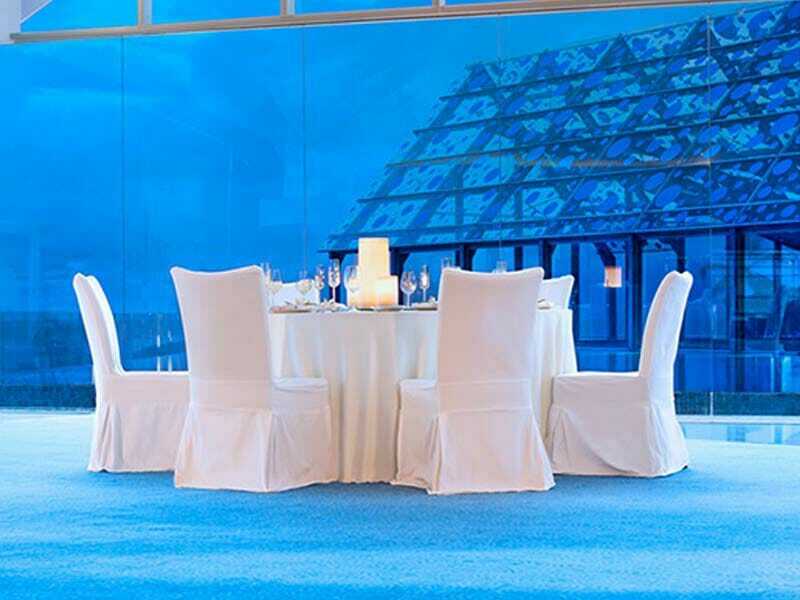 Every element of this incredible resort has been carefully considered to guide you through each stage of your holiday and the result is one of award-winning elegance! 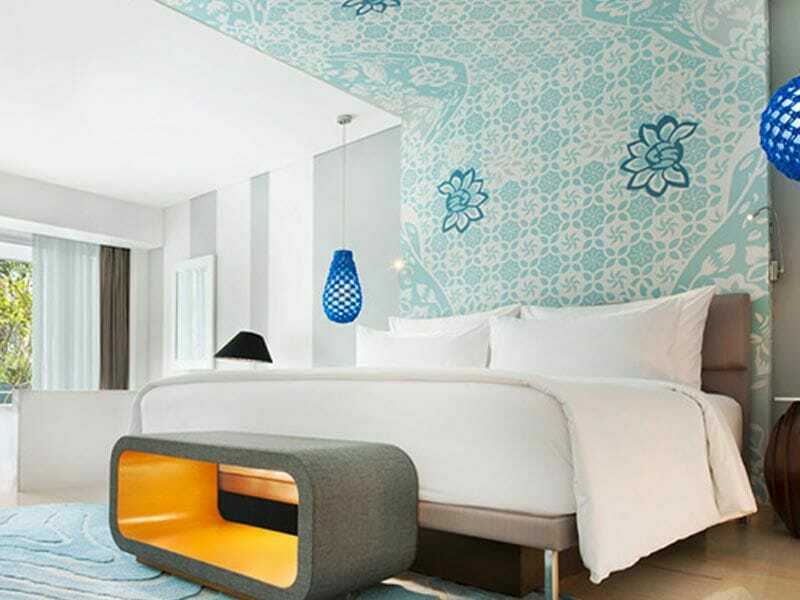 In terms of features, Le Meridien Bali Jimbaran is truly second-to-none. Features include all the classics—a saltwater pool with swim-up bar, separate kids pool, a day spa and 24-hour fitness centre, free beach shuttle and more! Invigorate yourself with a yoga or aquaerobics class, indulge in wellness services at the spa and salon, take a day trip to a local village for a private Balinese cooking lesson or simply unwind in the sun while the kids enjoy pizza and movie nights, Balinese dance lessons, tie-dying, fan painting and canang sari making at the J Kids Club. 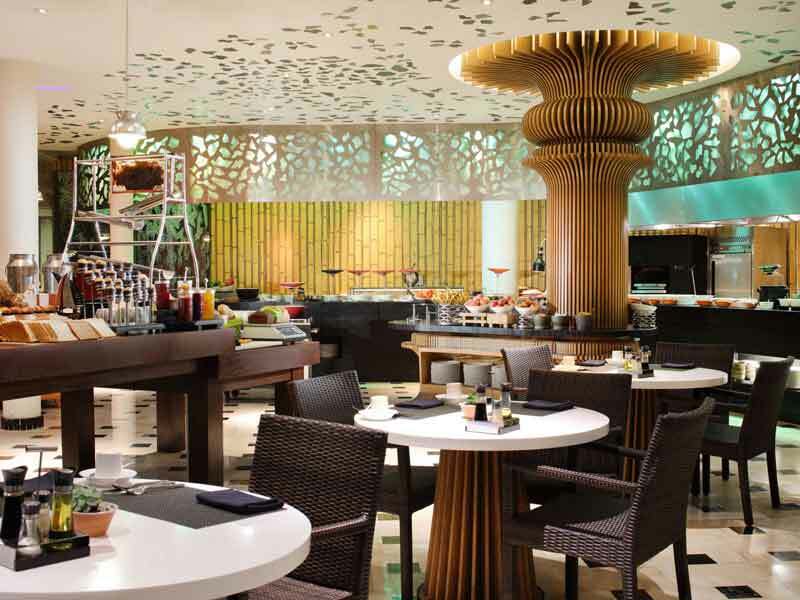 When it’s time to eat, choose between over 6 dining options—from lunch by the pool to drinks on the rooftop, there’s something for everyone at Le Meridien Bali Jimbaran. Why go to Le Meridien Bali Jimbaran? 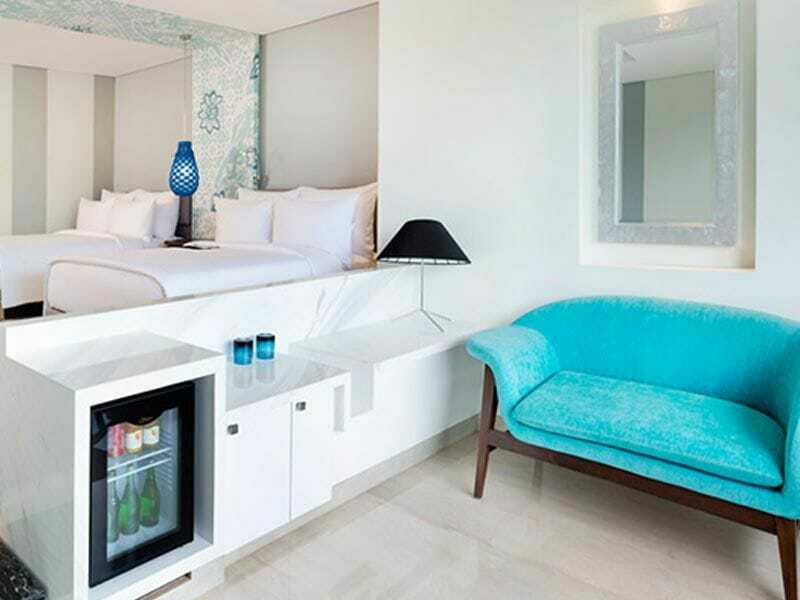 At Le Meridien Bali Jimbaran you will have the opportunity to enjoy a mix of Asian and international food, enjoy luxurious and ultra-modern accommodation, observe traditional Indonesian influences and get out to explore. The Jimbaran area isn’t quite as built up as other places on the island so you can enjoy a lifestyle that’s truly unique. In places, you can still see some glimpses of the fishing village culture and local Balinese way of life! If this sounds like your perfect holiday to Bali, give us a call now on 1300 332 254! 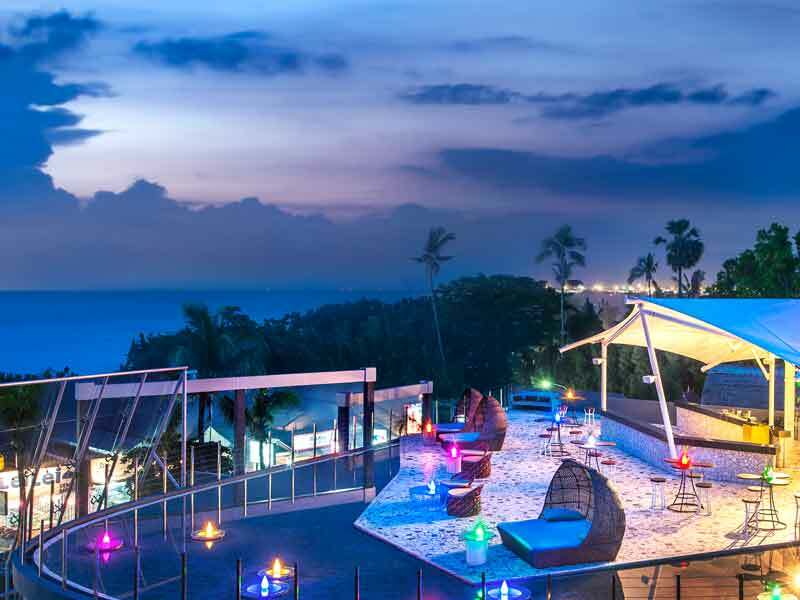 Le Meridien Jimbaran is just a few minutes’ walk from the Jimbaran Bay beach—home to a long stretch of golden sand, fabulous beach clubs and fresh barbequed seafood! Set approximately 20-minutes from the International Airport, it is a great holiday destination for travellers who want a balance of modern luxury and traditional Indonesian experiences. Slightly less developed than some of the other Balinese resort towns, Jimbaran doesn’t have as much choice in terms of shops and bars. This said, there are more than enough fantastic options for you to enjoy during your holiday! Exploring from Le Meridien Bali Jimbaran is easy. 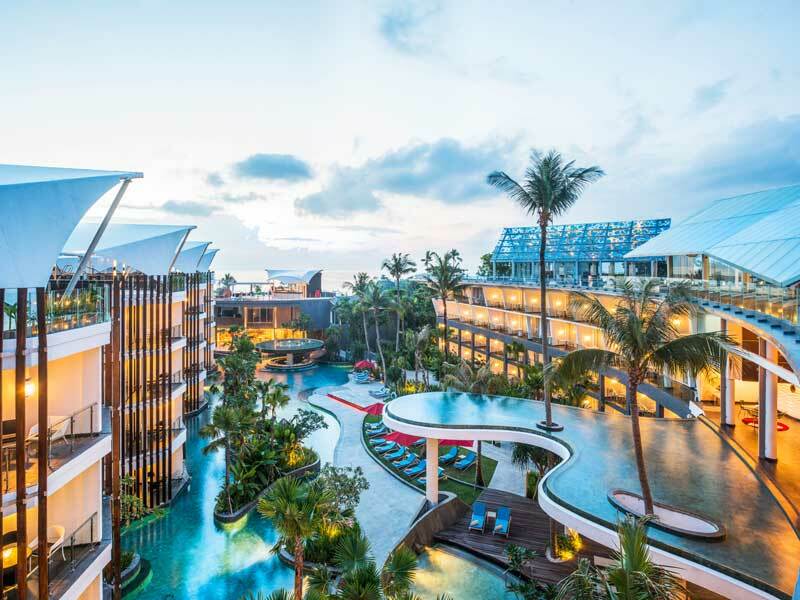 Take the short drive to Kuta, where the kids will go crazy for the Circus Waterpark and the adults will love the world-famous surf, shopping malls, and markets. If you get a rainy day or two, Kuta’s Upside Down World is a family crowd pleaser, while couples and groups of friends might enjoy taking on the Pandora escape room challenge. Tanjung Benoa Beach is just 25-minutes from the resort and offers a range of water sports as well as day trips to Turtle Island where guests can learn all about turtles and even hold one! Jimbaran itself is one of Bali’s best surf sports for kids and beginners. The smaller waves and calmer currents make it a safe spot for newbie surfers, plus there are a range of surf schools offering lessons year-round. If you want to learn more about the Indonesian culture and history, a visit to some of the temples is a must. Uluwatu Temple (25-minute drive) is one of the six major temples on the island and is set into the cliffs overlooking the ocean. Top tip: visit at sunset to see the Kecak Fire Dance show. Beautiful hotel, with excellent breakfast and very comfortable and luxurious rooms. A few steps away from the Jimbaran beach and its restaurants. The staff are excellent, as one would expect. Great facilities for kids, too.